WINNIPEG — The Minnesota Wild never found a way to get it going on the road against the Winnipeg Jets and now find their season over. Minnesota dropped a 5-0 decision in Game 5 against the Jets on Friday to get bounced from the first round of the Stanley Cup Playoffs. The Wild lost all three contests at Bell MTS Place in Winnipeg, including the opening two games of the series. They had a strong performance in a 6-2 win in Game 3 at Xcel Energy Center but, outside of that one game, the Wild only scored three goals combined in their four losses to the Jets. "It's a tough building. They're a dangerous team. They get a quick one, and the building gets into it," said Wild goaltender Devan Dubnyk. "A couple deflections, and you can see that's how a game can kind of run away from you." The Jets brought an onslaught of firepower early on Friday, with Jacob Trouba scoring just 31 seconds into the game. Winnipeg made it a 4-0 lead before the game was even 12 minutes in. Dubnyk was pulled in favour of Alex Stalock, after the Jets scored four times on their first 10 shots. "That was the game if you look back," said Minnesota captain Mikko Koivu. "We couldn't defend like we did the first two games here. We know they want to start hard, that's what they do at home. But like I said, first two games we were good at it. But tonight, we couldn't respond." "Ultimately, the game was lost in the first period," said Wild head coach Bruce Boudreau. "You have two periods of hockey left and stranger things have happened. For us it was more about trying to right the ship and get to our game. I think for stretches there we did a bit. We just couldn't get the one (goal) to go in to get things sparked." Winnipeg's Bryan Little, Brandon Tanev, and Joel Armia all scored their first goal of the playoffs in the opening period. Mark Scheifele's fourth goal of the post-season was the 5-0 dagger, coming 32 seconds into the third period. "I think we have a great system. 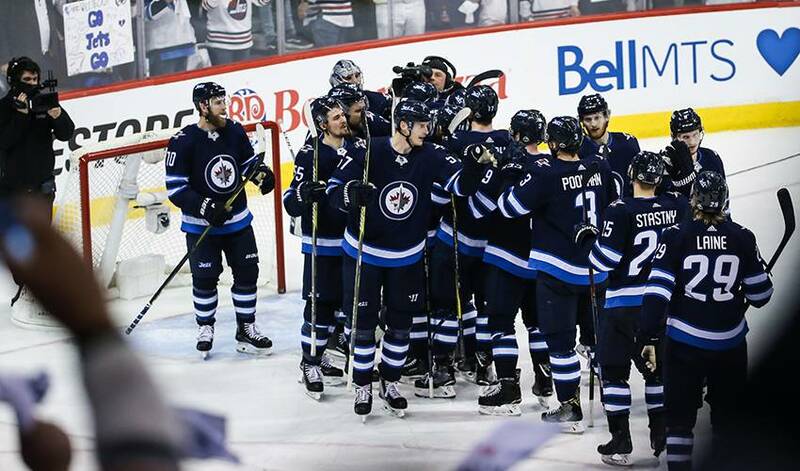 I think guys understand their role and the leaders in this group show the way," said Jets goaltender Connor Hellebuyck, who followed up his shutout in Game 4 with a 30-save shutout in Game 5. "The young guys that come in or the guys that don't play a lot come in and they're doing a fantastic job and they're just following suit." Winnipeg captured its first playoff-series victory in franchise history, following its first win in the post-season back in Game 1. The original Winnipeg Jets — now the Arizona Coyotes — only won two playoff series, beating the Calgary Flames in 1985 and 1987. The Wild are now 11-10 all time in elimination games, and join Pittsburgh and Anaheim as the only clubs to have made the playoffs in each of the last six seasons. Minnesota has not won a playoff series since 2015, when the Wild beat the St. Louis Blues in six games. The Jets will face the winner of the Nashville-Colorado series in the second round of the Stanley Cup Playoffs.